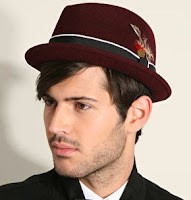 It rather annoys me when hats become fashionable. I’m a hat wearer from way back and so when you have places like Glassons and Supre selling fashion-hats it irks me that non-hat-devotees will be wearing them around. Think the great Fedora rush of 2008. I think it takes a certain confidence to pull off a hat. I don’t know what it is, but it seems like the hat-wearing types are often quirky people, who kinda know they’re strange but can pull anything off for that reason. Of course you’ll always get bartender types who will wear their fedoras to the dying day (although you could say I was once one of them too, I never took my headwear to the bar). It’s part of the men’s bartender I’m-so-freakin-uber-cool uniform of fedora, waistcoat, and stubble. But for the rest of the people that followed trend and purchased the necessary hat, where is it now? Fedoras were around and cool for years before, but at the time you basically couldn’t turn a corner without seeing one upon one’s head. I guess because it was an extremely accessible step into the world of hats – basically everyone looks good in one and let’s face it, they make you look cooler than you really are. However, I don’t think this is the case with the latest trend: cloche hats (thinks 20s, Angelina Jolie in Changeling). It’s a pretty specific style for your regular Jo-fashion. And it’s a risky thing to bring into the shops because, although I’ve seen a couple of brave girls try them on in front of their friends and have a giggle, I’ve not yet seen one on the street. To wear such a hat makes a pretty clear statement: “I follow fashion trends and this is the latest one”. If you have previously owned a cloche hat it’s pretty likely that you’re not going to wear it for a while now, wait ‘til the moment has passed, for fear of looking like a blind trend devotee. Berets have made their way back aswell and I must admit to purchasing one while in Melbourne, however it’s only adding to my collection of hats rather than setting the scene of a hat-filled life. Again, a beret is an easy way to slip into the world of the hat-wearer. It’s casual and can be pulled off without looking trendy-tacky. Basically my message is; if you buy everything you’re told by stores and magazines, you would have to a) be very rich and b) be a bit confused about who you are and what you wear. A hat is a pretty big fashion statement to make and if it’s just “of the moment” then as far as I’m concerned it’s the wrong statement altogether.